To view availability and make bookings go online at westparleymemorialhall.org/bookings.html, please email peskettgi@gmail.com or contact Gary Peskett on 01202 579394 for all hall booking enquiries. 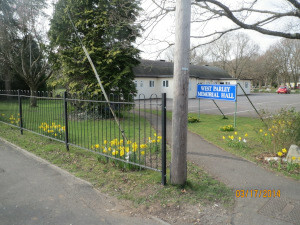 West Parley Memorial Hall, a Charitable Trust, was opened on 30th May 1964 for the benefit of the community and local organisations. 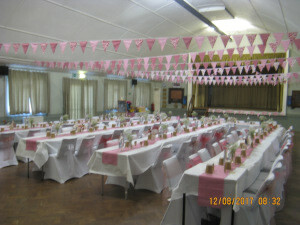 Since that time the Hall has been hired regularly and its facilities enhanced. When completed, a new patio will be located immediately adjacent to the hall's western wall and together with the grass area to the oak trees, will be available at no extra charge. The charity is independent of the Parish Council and is administered by a management committee who maintain a clean, bright and inviting venue, for a wide range of activities and events including social, educational, dancing, anniversary parties, weddings, dog shows and meetings. The Hall can accommodate around 250 people seated in theatre style for meetings and up to 150 seated at tables for social occasions and activities. A large stage and a room to the left can be used as a committee meeting room or small group meetings. having an event? the Memorial Hall is your ideal local venue!The Memorial Hall is your ideal local venue! In recent years, the hall interior has been redecorated and other facilities undergone complete refurbishment. It has a large kitchen, with kitchen units and appliances which include a gas cooker, microwave and water heater, plus cups and saucers and side plates sufficient for over hundred persons. Some cutlery is available. All items together with teapot and kettle are included in the hiring charges. The Parish Council owned Recreation Ground beyond the oak trees may also be available for use in return for a donation, subject to availability and agreement of West Parley Parish Council. However, please note that commercial activities will not be granted permission. Contact the Clerk on 07979 853697 or email enquiries@westparley-pc.gov.uk for information regarding the Recreation Ground only.